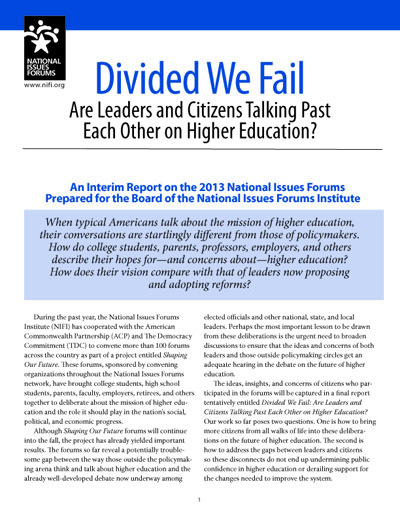 Recent studies describe postsecondary faculty in the United States and abroad as “divided, disillusioned, distressed.” The sense that one gets from most scholarship and stories on the professoriate is that this group of professionals has been hit hard by the restructuring of academic positions and additional pressures for accountability and performance. Consequently, it is a struggle for faculty today to find and pursue meaningful work. This Kettering Foundation working paper offers a counterpoint to these accounts. KerryAnn O’Meara interviewed 25 faculty members in higher education civic engagement to understand the origins of their sense of civic agency, the enabling and disabling conditions they encounter, and how they respond to barriers. Rather than divided and disillusioned, these engaged scholars are strategic and focused. They describe deep commitments to work that they love, integrating their teaching and research with public problems. None of these faculty members describe work lives filled with crisis and loss. Rather, they are networked and deeply connected to community partners, students, and other faculty. O’Meara, an associate professor of higher education in the College of Education, University of Maryland, considers what these scholars are creating in terms of a “new normal” for higher education and its relationship to public work. These cases provide a window into what civic agency looks like in action and what higher education might look like if it continues to embrace public work.